If cute could kill, these two little girls would strike you dead. Watch as two youngsters experience their first judo match, complete with bowing, throws, and hugs. 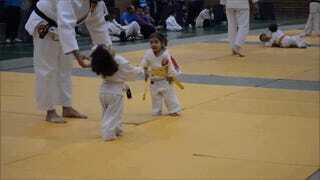 As we've seen before, kids doing martial arts is truly dangerously adorable. These two little girls from Madrid, Spain have mastered it. According to The Huffington Post, the above video is from a judo school called PJ Judo.